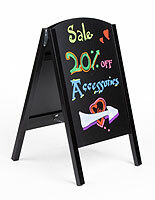 Common Size: 21" x 34"
Slide-in 21" x 34" write-on blackboards allow users to easily erase and change messages. Wood a-frame with black finish has a classic style. 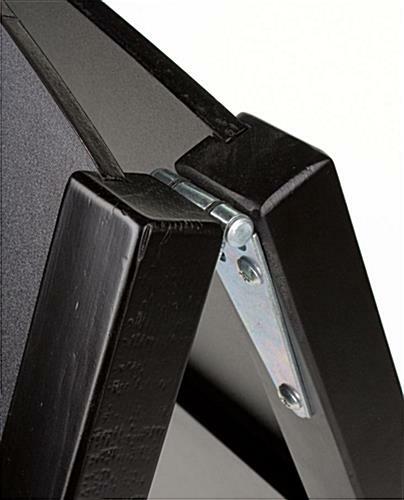 Top hinges for folding the unit flat for easy storage and transport. 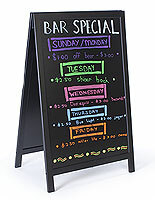 Textured blackboard designed for use with stick chalks, wet-erase neon pens and liquid chalk markers. 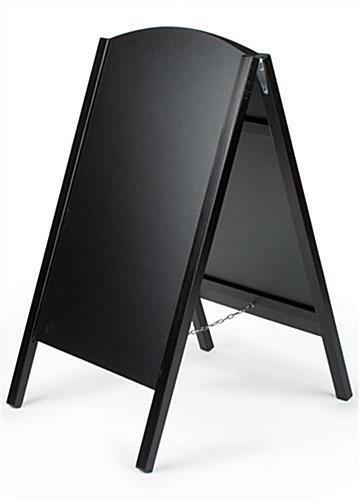 This black chalk board sign is an ideal choice for business locations needing to change their advertisements or menu items frequently. Users can use their creative skills to custom design their messages. 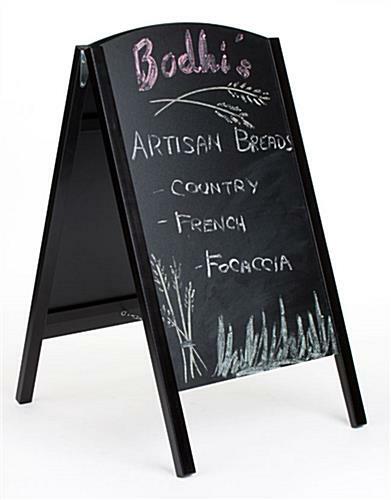 This a-frame blackboard, chalk board sign that is inexpensive is engineered from wood with a black finish that coordinates perfectly to any indoor business environment. 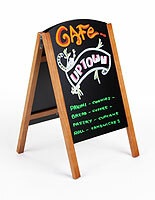 Restaurants, bars, cafes and retail stores are just some of the many businesses that use the menu chalkboard. In addition to commercial settings, these chalkboards can also be used as a teaching tool in classrooms, schools and daycare centers. 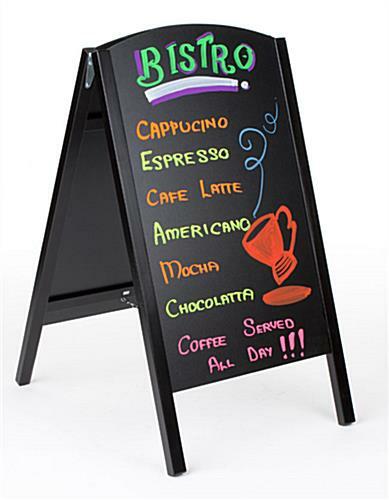 An a-frame menu board is sure to command attention no matter where it is placed! 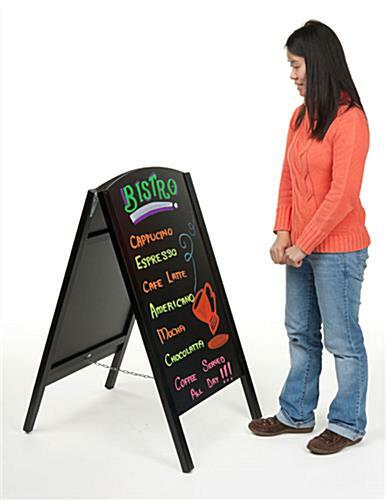 This menu chalkboard, chalk board sign features two writable surfaces. Each unit is 21" wide by 34" tall, giving users plenty of space to write messages. 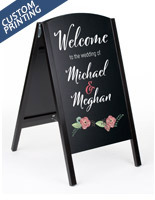 This chalk board sign that is dual-sided is great for businesses that are looking to create a completely customizable message. Users can design their own text and phrases that can draw customers into their establishments. 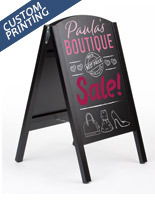 This chalk board sign, such as an a-frame menu chalkboard and sidewalk display, is a perfect way to alert customers to sales, as well as other on-going promotions. 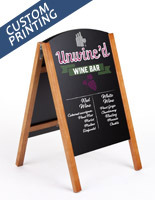 Unlike many other a-frames that have glued blackboard insert, the writing surface in this wooden chalk board sign can slide-in and out from the frame. This enables users to easily and conveniently update their message on the tabletop. Messages written with traditional chalk, wet-erase neon pens and liquid chalk markers can be easily cleaned by using a damp or wet-cloth. Sometimes, customers may experience some difficulties in cleaning the message. Therefore, the purchase of this a-frame menu board comes with a magic eraser. 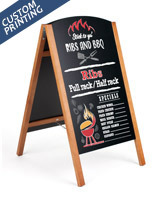 With this a-frame menu chalkboard, messages can be updated as often as desired to always show on-going and daily events. This sidewalk display that has wooden frame is mainly design for indoor use. However, users can also place them outside under fair weather conditions. 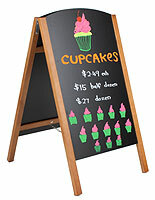 When not in-use, this a-frame menu chalkboard can be folded together for easy storage and portability. 24.3" x 41.5" x 30.3"
We are pleased with this chalkboard. It is sturdy, and the base is wide enough to keep it from tipping over like our last board used to. It is also great that you can slide the boards out to write on them. So far, we love it! Great quality board and exactly what I wanted. EXCELLENT quality and looks GREAT! Great Product! Just as described! We painted it, made it our own. A fantastic blank slate to personalize for your company or group. We plan to buy many more for our other bars. We bought this board to use at events to help our homeless pets get adopted. Easy to use, clean, and transport. Hope to get many years of use! We love this! We're so glad to be able to help homeless pets find their forever families. Thanks for shopping with us! Very happy with our board. I love the fact that both side can be removed. So much easier to draw and write.